So I spent some time learning how to create a basic camera setup within UDK for my Showdown competition entry. This was also my first time entering the kismet editor. It turns out that I was just over-complicating things when the solution was pretty simple. The first thing that the user wants to do is create a spawn point (anywhere on the map works fine) and a camera. Position the camera where you will want to keep it stationary. Open up the kismet editor and right-click anywhere on the editor. Add Event / Player / Player Spawned. Next to that node, go to New Action / Camera / Set Camera Target. 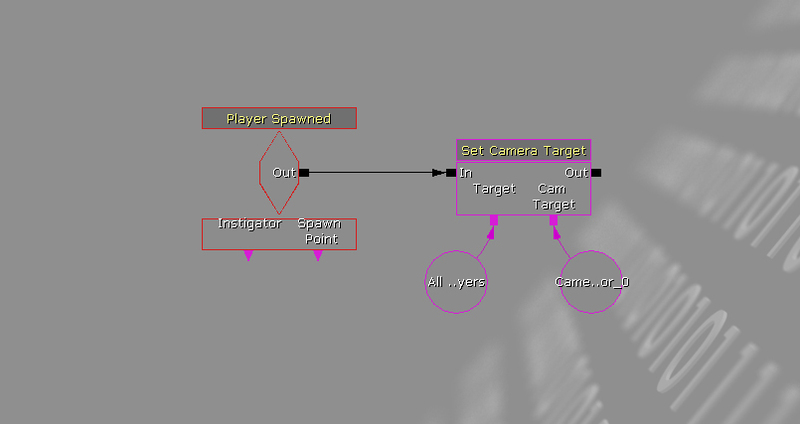 Now just connect a player variable (New Variable / Player / Player) to the target slot of the Camera Target. Add the camera by selecting it in your scene, then right-clicking in the kismet editor and selecting New Object Using CameraActor. Hook that up to the Cam Target slot of the Camera Target. Now if the user plays the level in the editor window, they should have a static camera where they positioned it.